Also called Symphyotrichum subspicatum. This perennial will bloom into the late summer and thrives on saltwater shorelines. 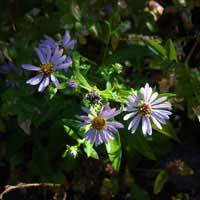 The rather lanky stems are topped with bluish purple flowers that look like miniature daisies (ray flowers). Douglas aster spreads by underground stems (rhizomes) which is great if you want free plants, but can be require maintenance if you dont.